As things are so tight in the Diocese might we suggest most definitely NOT GOING AHEAD with the renovations INSIDE Our Lady Queen of Peace Church in Bray which have been approved by Archbishop's House at the request of the Parish Priest Fr. Larry White. The ordinary Parishioners were NOT asked to vote on it or to give their views or were even consulted. The MAJORITY of the Parishioners are calling what is going to be done to the Altar area a DESECRATION of the beautiful Altar that is already there. They and their families raised the money to build this Church back in 1946 and like the inside as it is. It is another matter that the roof NEEDS to be replaced and has been in need of this for some years. That is ALL that needs to be done at this time. The Sacristy is perfectly fine as it is and does not need to be RIPPED APART either. I am sure those working in the Church area like the Sacristan, flower arrangers, cleaners can vouch for this that they are happy with things as they are. MONEY HAS BEEN HELD BACK BY ANGRY PARISHIONERS since it was announced that this DESECRATION was going to take place. There are relics in the beautiful altar that is going to be torn asunder and whole thing has upset so many who have NO SAY IN THE MATTER. The Parish Priest Fr. Larry White formed his RENOVATION COMMITTEE with close friends in the Parish who would give the YES approval to his plan to do this work which will cost a lot of money in a time when it is not available AND on a project that NOBODY IN THE PARISH WANTS. The Parish Priest would not send around a form to have people vote on it and even if one was allowed it would need to be done by those OUTSIDE the Parish because things in this particular Parish are NEVER ABOVE BOARD. As a matter of interest said Parish Priest Fr. Larry White did the SAME THING regarding the car park area which was fine since 1946and without consulting Parishioners had DREADFUL metal ramps installed and painted with yellow lines and also metal posts which have been knocked over so many times we have lost count by the cars going in and out (we are sure doing damage to the cars as well as the posts so lets hope the Parishioners sue the Parish for the damage!!) of the Vevay Road so that now they have finally been taken down WHILE THE PARISH PRIEST IS AWAY SUPPOSEDLY ON SICK LEAVE. If he was there he would be making sure his idea stayed there. With all the ramps, posts, markings it is like a supermarket or factory car park now and now that of a Church. 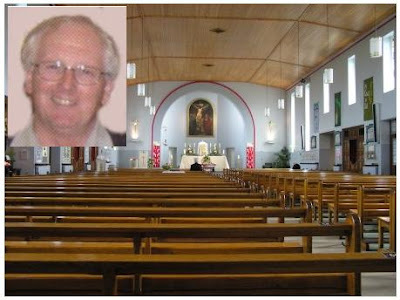 This Parish Priest has VERBALLY ABUSED PARISHIONERS parking close to the front of the Parish Centre to deliver items and has been known to leave HANDWRITTEN NOTES on the windscreens of cars and vans parked there criticising where they are and how long they stay and now NO VANS are allowed although some men who do afternoon shifts in local shops used to park their vans there for 30 minutes to get the 1.05 p.m. Mass and now they are not allowed to. They are being turned away from the Church like many others. The Parish is run by a DICTATOR who has to go. 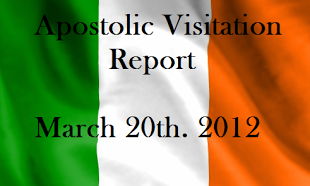 YOUR GRACE ARCHBISHOP DIARMUID MARTIN please take note. You want to save money in the Diocese - well STOP THE DESECRATION OF THE INSIDE OF OUR LADY QUEEN OF PEACE CHURCH BRAY P - L - E - A - S - E!